So far this year I have written entirely about things happening in Greenbelt, but Greenbelt does not exist in isolation. This is the first of a series of posts on short excursions from Greenbelt. I hope to visit some of Greenbelt’s immediate neighbors such as NASA Goddard Space Flight Center, University of Maryland, Beltsville Agricultural Research Center, etc, where many Greenbelters work or visit. 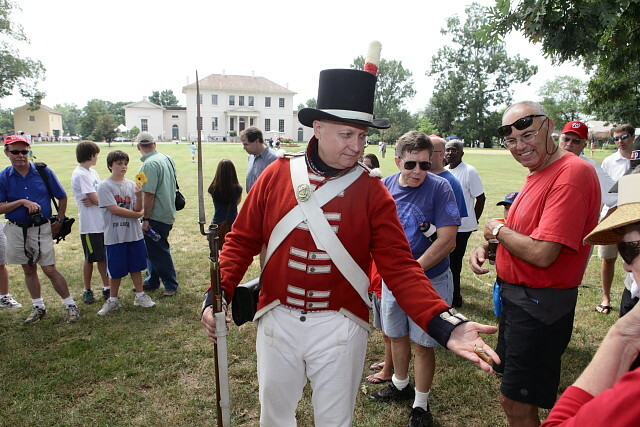 Last Saturday, I visited Riversdale House Museum in Riverdale Park to check out its annual Battle of Bladensburg Encampment. I ran into quite a few Greenbelters there. 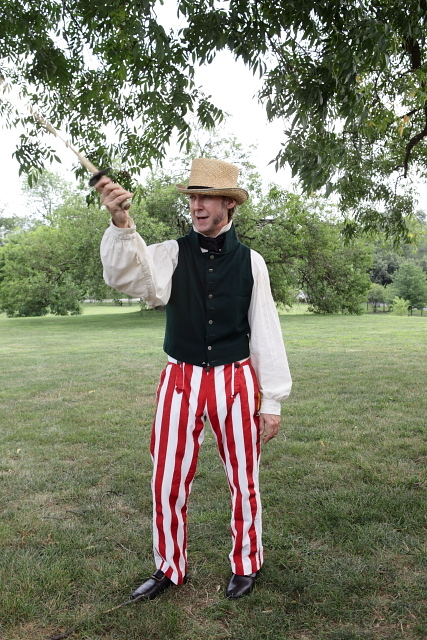 One of the most notable events in American history happened about six miles from Greenbelt’s city center. 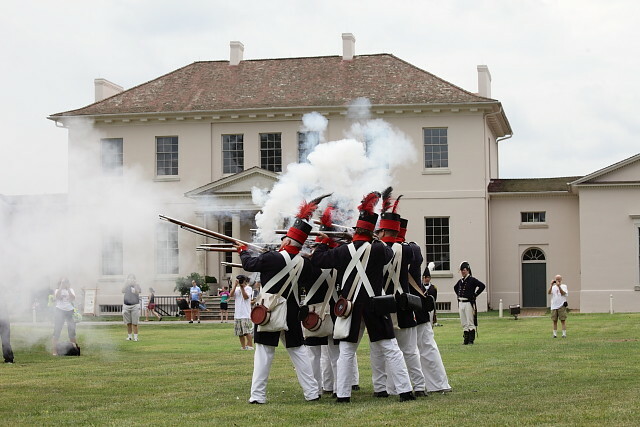 On August 24, 1814, during the War of 1812, British forces defeated an American army at the Battle of Bladensburg and then went on to occupy Washington, D.C. and burn the U.S. Capitol and the White House. 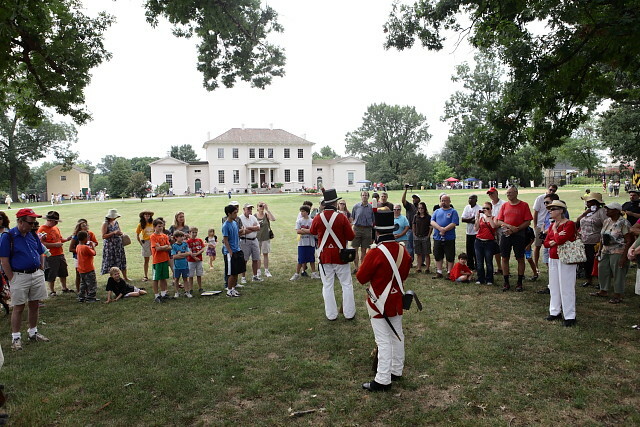 Each year on a Saturday in August, a Battle of Bladensburg Encampment is held at Riversdale House Museum near the site of the battle. 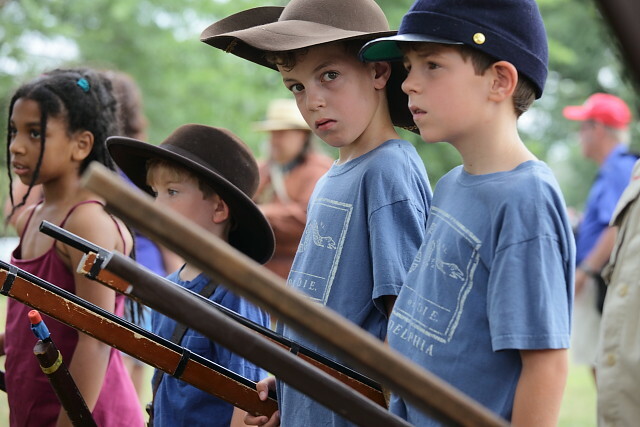 It is attended by reenactors on both sides. 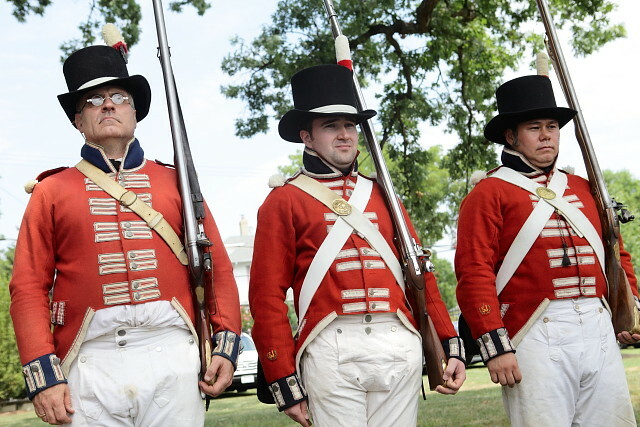 Reenactors representing British Royal Marines tell the British perspective of the battle. 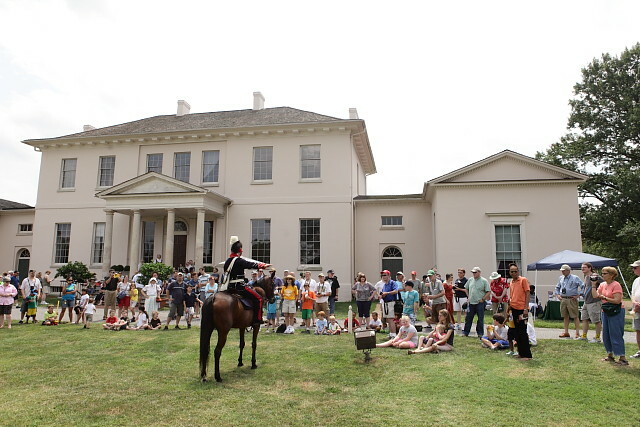 In the distance is Riversdale House, a five-part, stucco-covered brick plantation house built between 1801 and 1807. 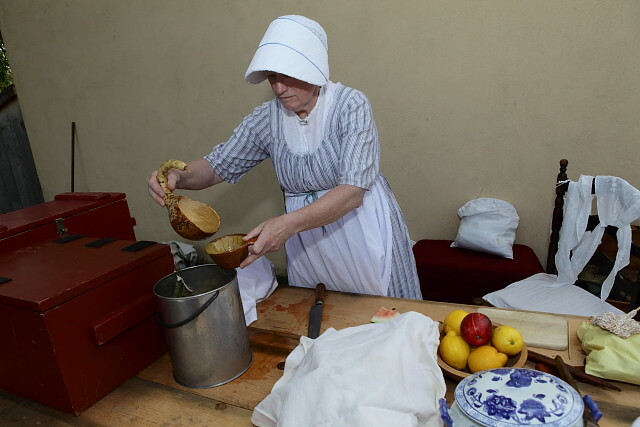 When the Battle of Bladensburg took place, the home was occupied by George Calvert, a descendant of Lords Baltimore, Maryland’s founding family, and his wife Rosalie Stier Calvert. 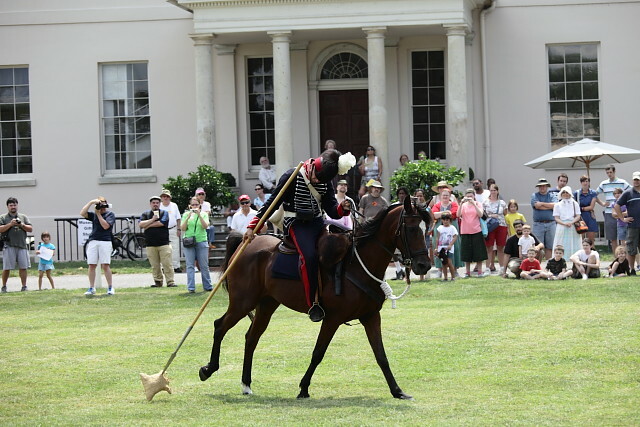 A Royal Marine shows a musket ball. Members of 1st Company 2nd Battalion of the British Royal Marines stand in attention. 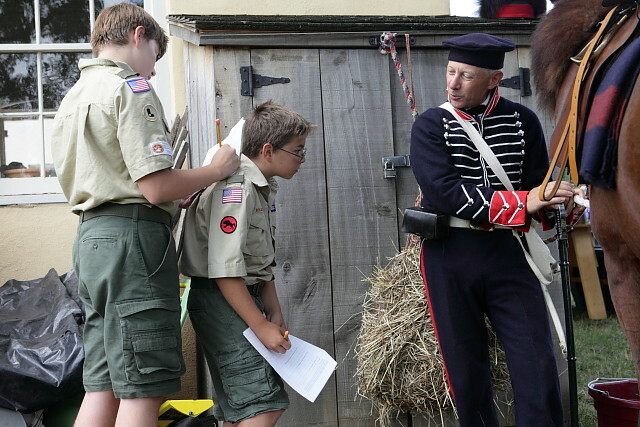 Two members of Bowie Boy Scout Troop 1283 ask questions to a reenactor representing Maryland Light Dragoons. 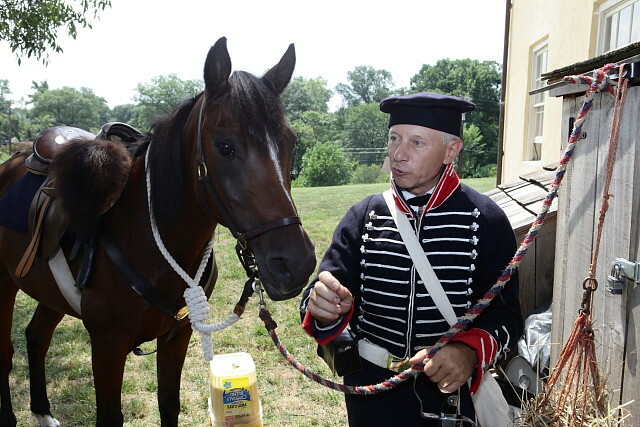 This was a Maryland militia cavalry unit which took part in the Battle of Bladensburg. 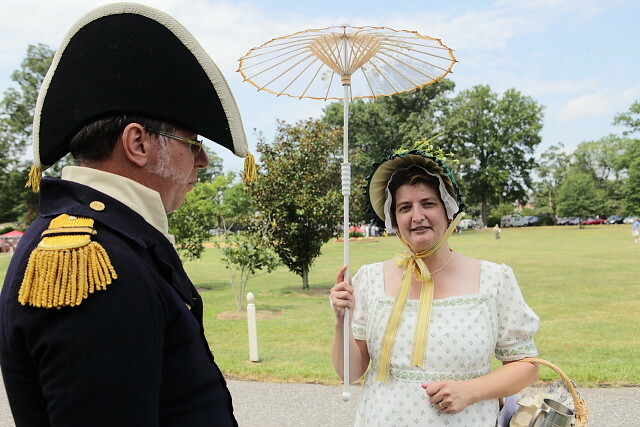 Rosalie Stier Calvert (portrayed by Katherine Spivey), mistress of the house, talks to a reenactor representing Solomon Frazier, a lieutenant under Commodore Joshua Barney. Rosalie Stier came with her father Henri Joseph Stier to America from Antwerp. It was he who started building Riversdale House, and after he returned to Antwerp, Rosalie and her husband George Calvert moved in. She wrote many letters to her family in Europe and these have been collected in a book titled Mistress of Riversdale: the Plantation Letters of Rosalie Stier Calvert. 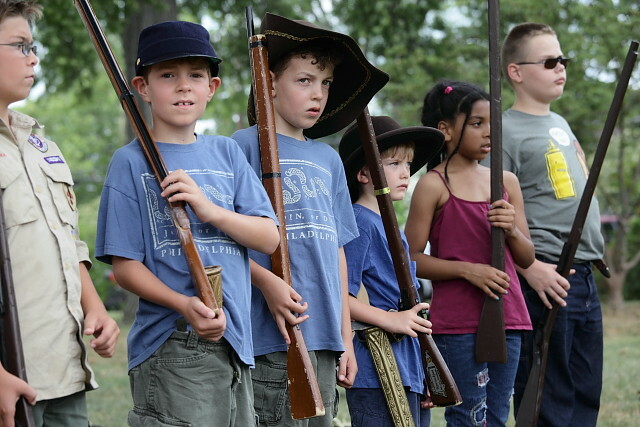 It was from these letters that historians learned about life at Riversdale and the Calverts’ experience during the War of 1812. Mrs. Calvert tells me that from this house she saw cannonballs with her own eyes and her husband and servants went over to the battlefield and carried back objects left there. Members of the 5th Maryland Baltimore United Volunteers fire their guns in front of Riversdale House. 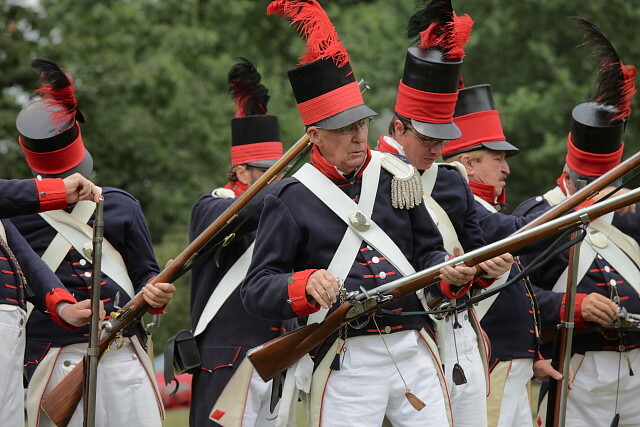 This regiment saw action at both the Battle of Bladensburg (August 24, 1814) and the Battle of North Point near Baltimore (September 12, 1814). The first one was a defeat and the second, a major victory where British Major General Robert Ross was killed. 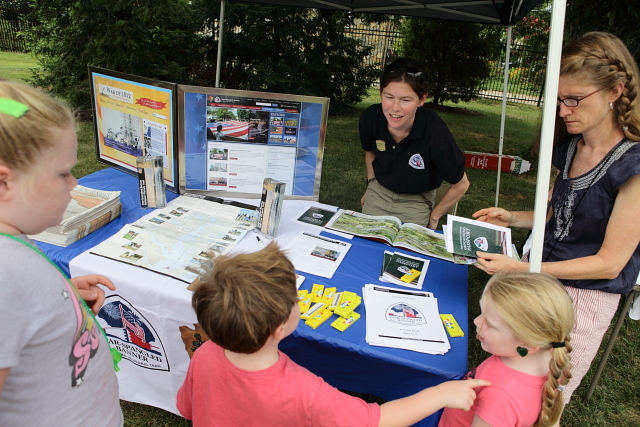 Behind the table, Suzanne Copping of the National Park Service works at the Star-Spangled Banner National Historic Trail’s offices in Annapolis. 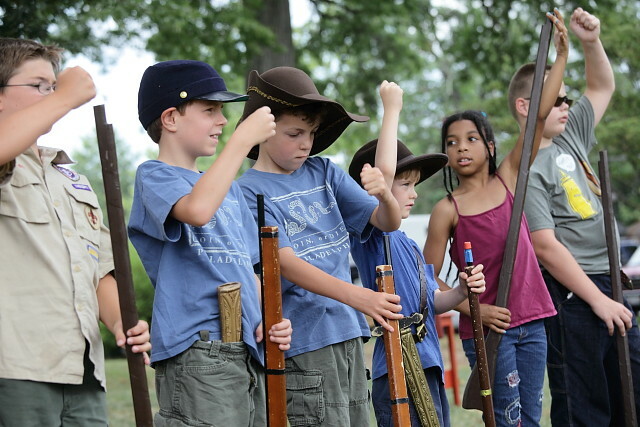 The 560-mile land and water trail tells the story of the War of 1812 in the Chesapeake Bay region. It was established by Congress in 2008 and is one of 19 national historic trails administered by the NPS. Copping has maps and programs related to the trail. John Giannetti is the chair of Aman Memorial Trust. 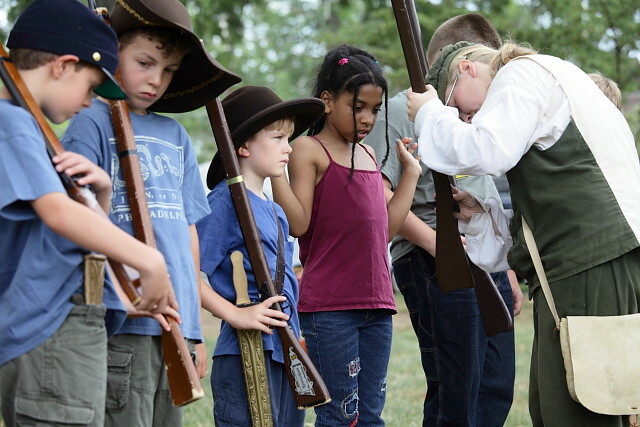 The trust has been raising money to build a memorial to commemorate the Battle of Bladensburg. 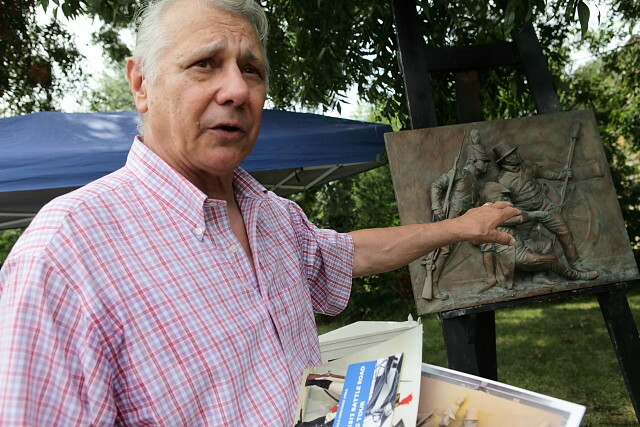 Here Giannetti points to a model of the memorial. 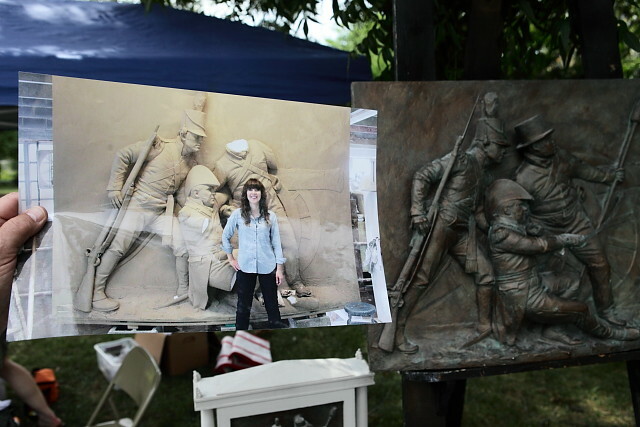 Giannetti shows a photo of the sculptor Joanna Blake in front of an unfinished plaster model. 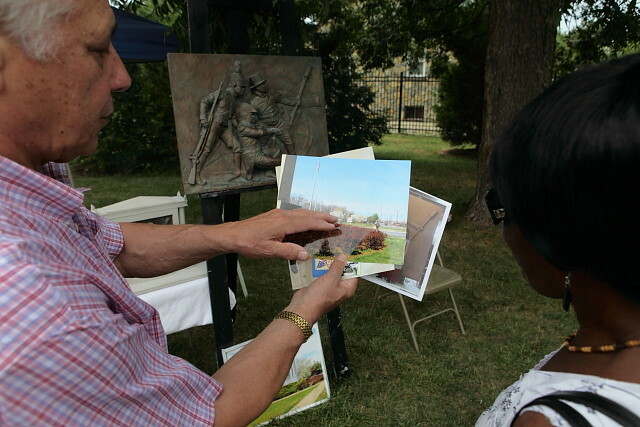 Giannetti shows a photo of the site to a visitor. 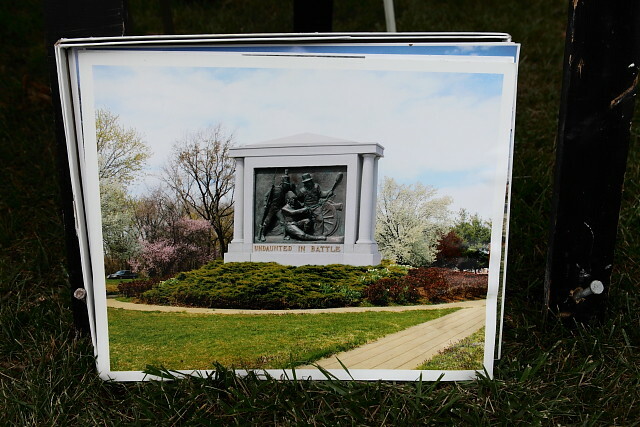 He says it will be located near the Bladensburg Peace Cross and the trust has raised $300,000. 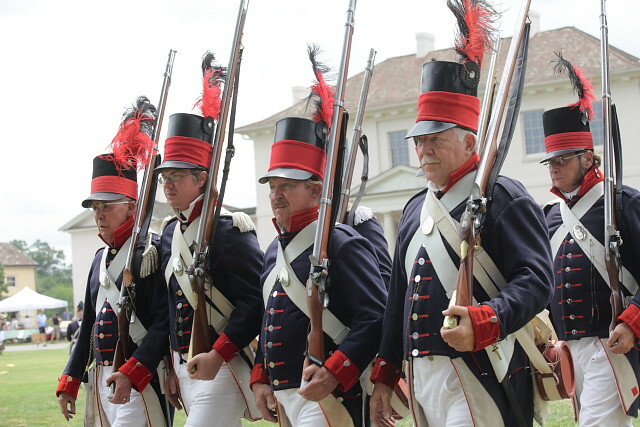 There are two years to go until the bicentennial of the Battle of Bladensburg. 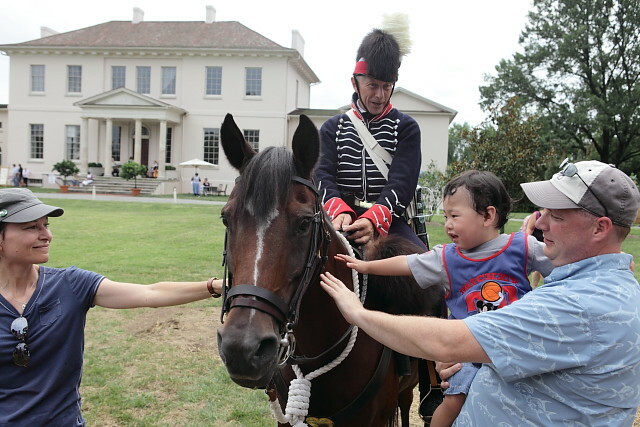 Visitors touch a horse of Maryland Light Dragoons. 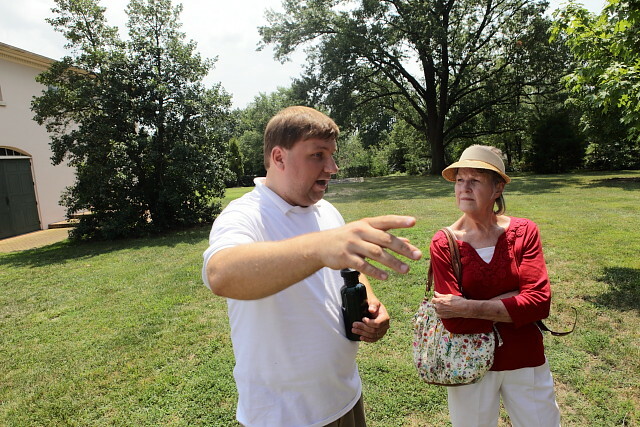 Aaron Marcavitch, Executive Director of the Anacostia Trails Heritage Area Inc., talks to a visitor. “ATHA Inc. is dedicated to preserving and promoting the historical, cultural and natural resources of the Heritage Area” (of the northern Prince George’s County). By the way, Marcavitch lives in Old Greenbelt. 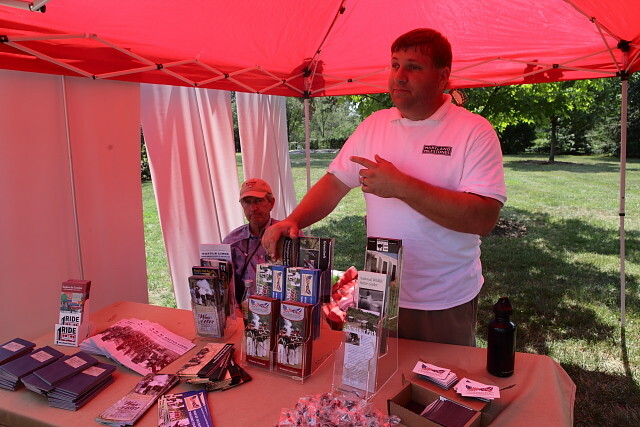 ATHA’s table has a number of maps and brochures available including “War of 1812 Battle Road Walking Tour,” “Undaunted, Battle of Bladensburg, 1814,” “Your Passport to the War of 1812 in Prince George’s County, Maryland,” “Southern Maryland War of 1812 Travel Map and Guide,” and “Battle Lines, Prince George’s County in the Civil War.” Marcavitch says that the next big event is only two weeks from now. 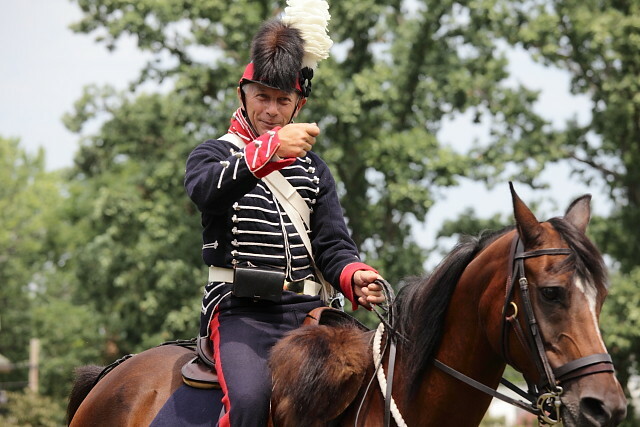 On August 24, the War of 1812 Visitors Center will open at Bladensburg Waterfront Park, and on August 25, there will be a celebration at the new Visitors Center with activities for the whole family. Several present and former Greenbelters pose with Rosalie Calvert. 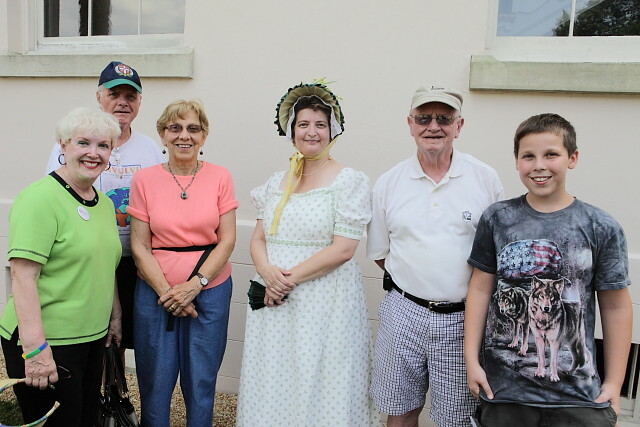 From left are Lyn and Bob Doyle, Mary Ann Baker, Rosalie Calvert, Bob Baker, and the Bakers’ grandson Andrew Baker. Many Greenbelters are in this group of bicyclists. 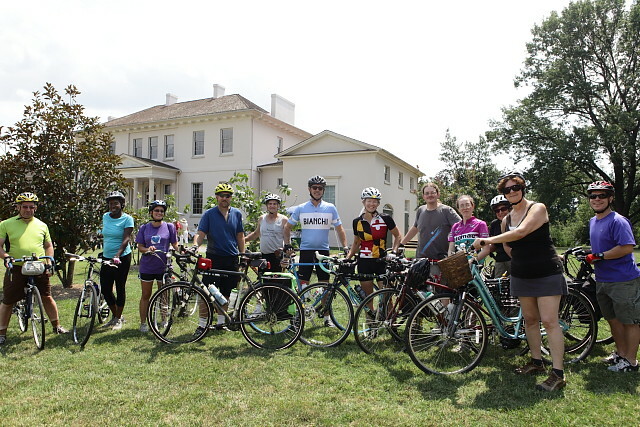 They rode from the New Deal Cafe to Proteus Bike Shop in College Park and then here. 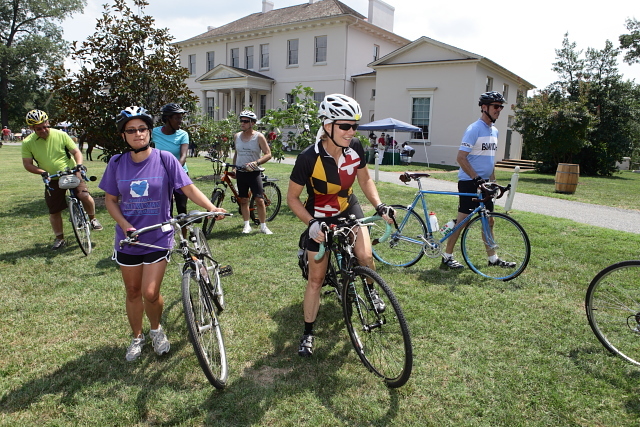 Wearing Maryland colors is Laurie Lemieux, a Greenbelter and co-owner of Proteus Bicycles.